Exfoliation is an effective method of removing the superficial layer of dry and dead skin cells. It can be done through chemical or mechanical means. Microdermabrasion Skin Renewal treatment is a non-surgical mechanical skin exfoliation method that leaves skin looking smoother, fresher and rejuvenated. What is Microdermabrasion Skin Renewal? Microdermabrasion Skin Renewal exfoliates skin without the use of chemicals or lasers. Tiny diamond chips, embedded in the tip, are vacuumed across skin to remove dry and dead skin cells. This skin rejuvenation treatment method is also known as the Parisian Peel or Diamond Peel. WHat is IT THIS TREATMENT commonly used for? On which areas can thE treatment be applied? The treatment is highly effective on the face, chest and back to rejuvenate and restore smoother, younger looking skin. It is also effective in the treatment of facial and back acne. 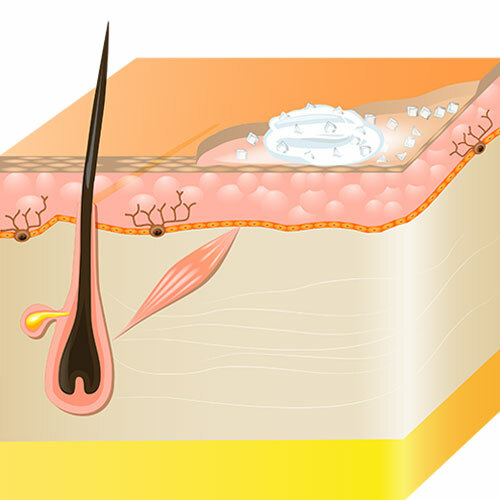 A single session of Microdermabrasion Skin Renewal Treatment can remove as many dead skin cells that would take three glycolic treatments to achieve. For acne prone skin, continued treatments help keep pores unclogged. How deep into our skin could THE TREATMENT Go? The treatment improves skin elasticity and texture at the cellular level. The vacuum and medical grade crystal controls can be tailored to individual skin type needs. This capability enables Microdermabrasion Skin Renewal treatment to produce the desired results effectively. Is it suitable for any particular skin type? Microdermabrasion Skin Renewal treatment is suitable for most skin types. Depending on your acne condition or pigmentation and skin’s sensitivity, treatments are usually scheduled one to four weeks apart. This is followed by a maintenance treatment done every four to eight weeks. • It is important to moisturise and re-apply sunscreen (SPF 15 and above with 5 to 10 % zinc or titanium or 3% mexoryl) several times during the day. • Avoid direct sunlight for a week. • Avoid Retin-A and glycolic acids for 2-3 days after the treatment. • Avoid swimming in chlorinated pools for a few days before and after as chlorine dehydrates skin and always avoid tanning beds. • Avoid waxing the treated areas for at least a week and in some cases, up to a month as they may be sensitive. Keep yourself hydrated. Microdermabrasion Skin Renewal treatment is suitable for most skin types. Depending on your acne condition, pigmentation and skin’s sensitivity, treatments are usually scheduled one to four weeks apart. This is followed by a maintenance treatment done every four to eight weeks. DOES MICRODERMBRASION SKIN RENEWAL HURT? During treatment, a mild pulling sensation and a gentle sandpapery feel can be expected. Most patients experience just mild or minimum discomfort.